For six of the eight years between 2008 to 2015, the growth of world import volume was lower than that of world GDP. What are the reasons behind this slowdown? Some arguments point to the reduction in China’s imports of processing trade and to the drop-off of Chinese economic growth. Three pieces of evidence serve to refute these arguments and support the conclusion that China is not the key contributor. Processing trade targets overseas markets, with most of the input imported freely and with zero tariffs. In 1979, in order to attract export-oriented FDI, China initiated a new policy to encourage this type of trade in special economic zones in four coastal cities. Processing trade boomed in China from the mid-1990s to the mid-2000s and held more than 50 percent of total exports. Initially the ratio of imports to exports was very high, even more than 100 percent, since the machinery and equipments were also imported for the new production facilities. Gradually, the ratio was reduced more and more, thanks to the localisation process of foreign firms and the active participation of local firms (Figure 1). Some argue that this reduction in imports could be responsible for the world trade slowdown. 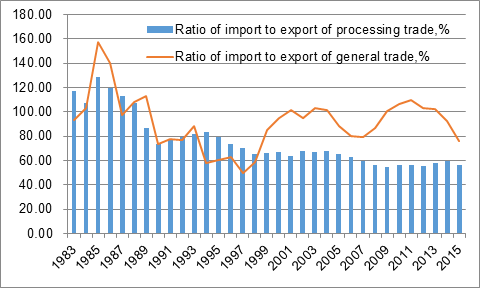 A counterfactual analysis, assuming that China’s processing imports would continue at a ratio of 80 percent (maintaining the processing import level observed from the end of 1980s to the early 1990s), gleaned the results shown in Figure 2. It seems that there is a negative correlation between the variables. 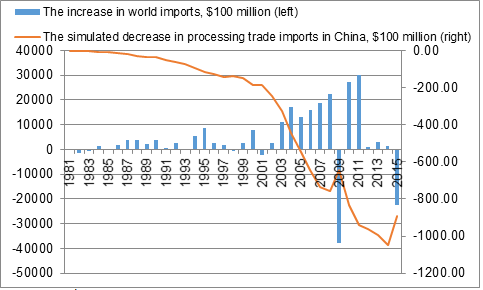 As the processing trade imports decrease, the change in world imports increases. So the recent world import stagnation does not appear to be coming from the reduction in China’s processing trade imports. The logic of this argument is as follows: along with the strong growth of the Chinese economy comes high demand for energy and commodity imports, driving up the prices of these goods and causing exports to boom. The slowdown of Chinese economic growth, therefore, leads to sluggish demand for energy and commodity imports, and a resultant collapse in prices of these goods and world trade. This story sounds good, but it is not the case. While it is true that Chinese economic growth is slowing, the imports of energy and commodities continue to increase, and the prices of global energy and commodities have collapsed. 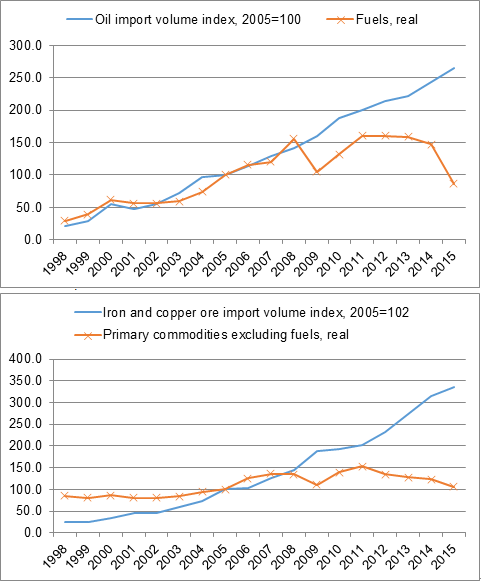 To demonstrate this point, the oil, and iron and copper ore volume import indices are constructed below (with 2005 as a base year), as well as the fuel price index and commodity (excluding fuel) price index, using the CPB World Trade Monitor monthly price indices (with 2005 as a base year, where the annual index is the average of 12 monthly indices). Obviously, the imports of oil and metal ore into China kept up closely with the price changes of the world. Before the financial crisis of 2008, the correlation was significantly positive. It seems reasonable to say that Chinese demand drove up the world price. However, this relationship collapsed after 2008. While the demand from China continues to increase, the world prices dropped dramatically. Can it be said that Chinese demand is responsible for this change? Finally, if China is the main source of the world trade slowdown, then China must have lost its share in world trade, especially in merchandise trade. 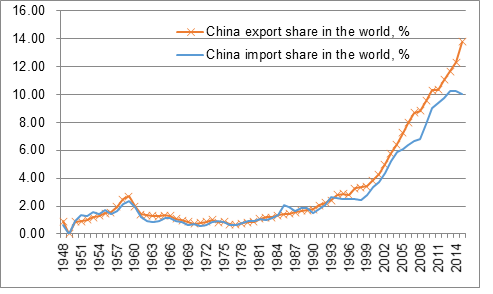 In fact, the global share of Chinese exports and imports actually increased in the last few years (Figure 5). In 2015, for example, in terms of exports, despite the 2.88 percent decrease in China’s exports, the country still gained a 1.47 percent share increase in world exports. In terms of imports, this year, China lost a 0.20 percent share in world imports for the first time. The slow growth of global trade in the last few years shocked the world. There are a lot of reasons for this, but China is not the key contributor to this slowdown. An alternative reason may be the disastrous impact of the global financial crisis on advanced economies, such as the US and EU. Almost 10 years after the fact, the world economy still remains in the recovery process, particularly advanced economies. It seems that we still have a long way to go for a new booming world economy. Song Hong is Assistant General Director and Senior Fellow at the Institute of World Economics and Politics (IWEP), Chinese Academy of Social Sciences (CASS).